The premise is simple: pick a project (take a photograph, make the bed, draw a picture, bake a cake, etc. ), do it every day in January, then show your work the following month in a big group show. Started 8 years ago in Philadelphia, by the Artclash Collective, Fun-A-Day has been spreading all over as a way to stay creative and beat the winter blues. A small group of us did it last year in Northampton, and it was a great success and lots of fun. We had art on the walls, listening stations, handmade books, comedy, dance, and musical performances. This year we hope to get more people involved and show the work in a central downtown location! We invite you to do a project every day in january and be a part of the show. No one will be turned away! 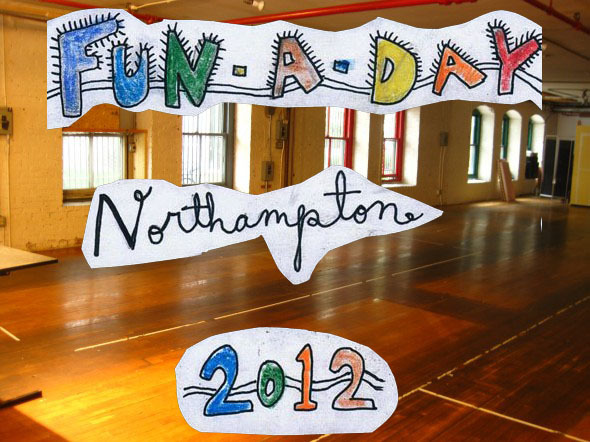 If you want to be involved, or have any questions, send us an email at northamptonfunaday@gmail.com. We encourage you to let us know your project ideas as soon as possible, but it is essential that if you do a project and want to be in the show, you let us know by January 31st, 2012.